Can you imagine your life without the symptoms associated with PTSD? Whether it`s caused by a severe accident, military tour of duty, some kind of abuse, or experiencing a traumatic illness, the symptoms of PTSD can devastate your life. At the Carlton NeuroFeedback Center, we can help you find drug-free, permanent relief from PTSD symptoms so you can feel like yourself once again. How can neurofeedback training remedy PTSD? PTSD can create unhealthy changes in the normal neural pathways in the brain. The resulting symptoms, such as anxiety and depression, are the result of these imbalances, caused by the trauma itself. These imbalances can now be measured with the use of a qEEG (quantitative electroencephalogram) or brain map. This map clearly shows which areas of the brain have been affected, allowing for a creation of a personalized “brain training” protocol. This individualized neurofeedback program is designed to retrain the brain to self-regulate. With training, the imbalanced areas in the brain improve, and so do symptoms. Think of it as “exercise for the brain”. Just like physical exercise can improve your muscle tone, neurofeedback training can improve your brain function. Eventually, as your brain “gets back in shape” the PTSD symptoms are also reduced or, in many cases, completely eliminated. Many patients report that the first sign of improvement is better, more restful sleep. As their training progresses, they are better able to respond normally to day-to-day life. Best of all, the improvements remain for the long run, because the brain forms new neural pathways as a result of the training sessions. Is there proof that neurofeedback training helps PSTD? Absolutely. Many studies have demonstrated the effectiveness of neurofeedback training. Most recently, a randomized, controlled study showed neurofeedback training was a highly effective approach for adults and children experiencing PTSD. See more research studies. Find out if neurofeedback is right for you – Free! Schedule your Free initial evaluation online today. Or, call the Carlton NeuroFeedback Center, and we will sit down with you one-on-one, discuss your concerns, and see how this treatment can make a positive difference in your life. 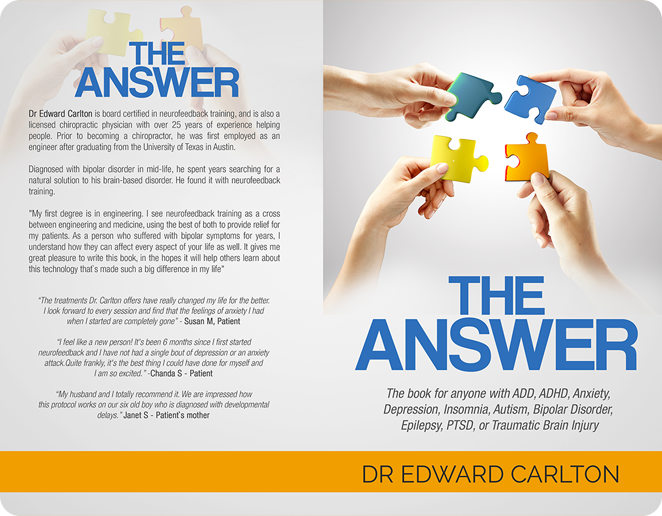 For more info, download Dr. Carlton’s Ebook, or check out why people choose us.